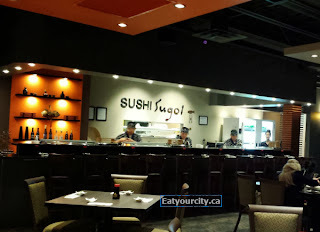 Posted by Some of our foodie friends have been eying up one of the newest sushi places that opened up shortly before Christmas down south, so we gave it a whirl a few weeks after they opened. The smell of fresh paint was still in the air when we dropped into the nicely appointed modern space with a large open kitchen in the back. Service was friendly, and we were excited to see what this Korean owned and run restaurant could do as we've had some good experiences with Korean sushi in the past - that and sushi is as much a part of their cuisine in Korea as it is in Japan. We started off with pots of fragrant green tea all around and picked out more traditional items to try, though there are some fusion notes here and there in the menu as well. 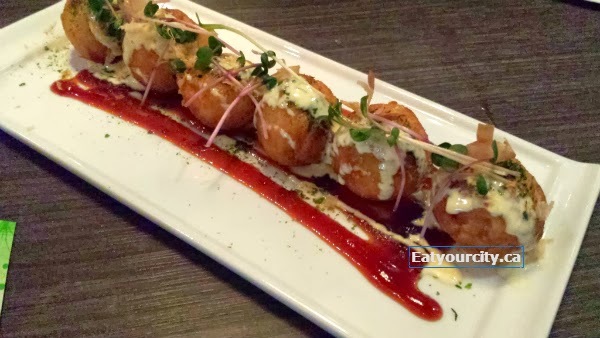 Next out was the Takoyaki balls which had a nice crisp crust, an almost gooey interior studded with pieces of octopus. They needed just a shade longer in the fryer and they would have been excellent. They didn't really need the tonkatsu sauce, but it was pretty for presentation. The Agedashi tofu was tasty in a pool of ponzu sauce, and made with medium soft tofu instead of the usual soft tofu, making for a denser bite. The Chicken Karaage was coated in a nice crispy batter, and fried to a moist perfection. I would have loved to see generous spoonful or two of grated ginger added to the chicken marinade, as the only notes of ginger we found was in the ginger based dipping sauce it came with. 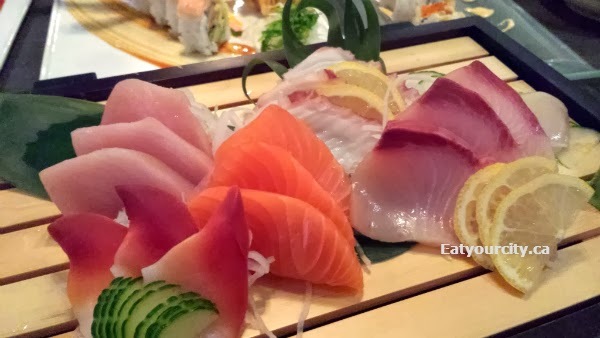 The Regular Sashimi platter had 6 types of sashimi on it: Tuna, surf clam, salmon, hamachi, mackerel and scallop. We quickly took out the lemon slices after taking pictures - while pretty, I'm not a fan of having lemon juice changing the flavors of sashimi. 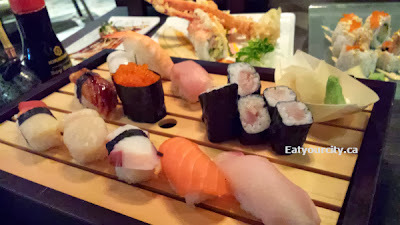 The Sugoi Sushi Combo A had 6 types of sushi along with 10 pieces of mini roll, which turned out to be tekkamaki's. The seafood was fresh and tasty, though the rice was oddly unseasoned - the rice used in the rolls we had later were seasoned, so just an oversight I think. 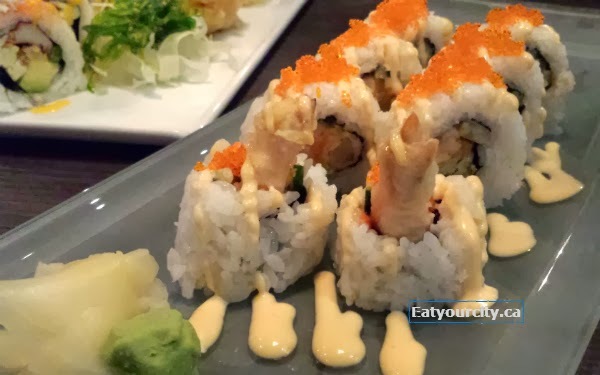 Next up was the rolls: the Dynamite Roll came out first, with a nice balance of flavors of crisp tempura'ed shrimp, creamy avocado, cucumber, scallops and a spicy mayo sauce. The rice was seasoned, but a bit on the moist side so it was falling apart a bit. The epic Sushi Sugoi roll was up next with a mountain of ingredients: Alaskan king crab, tamago, asparagus, crunch, avocado, seaweed salad, fennel, salmon roe, 3 kinds of special sauce. The "crunch" turned out to be tempura bits, with the fennel and seaweed salad a garnish and surprisingly, despite the long list of ingredients, you are able to appreciate each flavor without having one dominant. 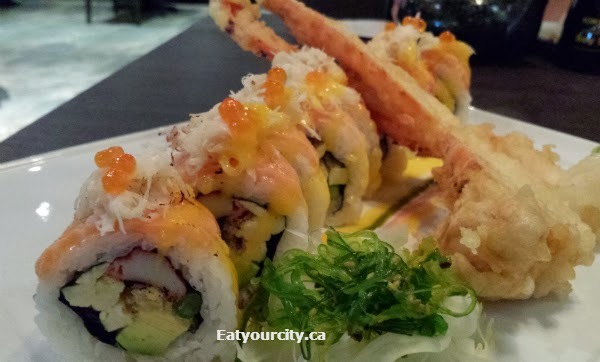 An Alaskan king crab leg is split, deep fried to perfection is also plated with the roll. I found that flaming the crab added too much smokiness to the dish, while others enjoyed it. 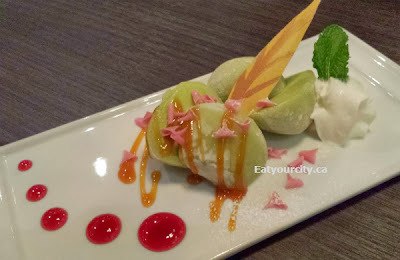 We didn't have room to try the deep fried tempura green tea icecream, but we made room to try the Green Tea Mochi Icecream. Its plated beautifully, with some raspberry sauce and caramel sauce (it got eaten up before I had a chance to take a jab at it) with some whipped cream to complement the delicate soft rice flour based mochi enrobing slightly sweet green tea icecream. A lovely end to our meal. Overall, Sushi Sugoi needs some time to work out the new restaurant kinks, and will shape up to be a nice addition to the food scene in the south of Edmonton.